If preparing for interviews feels tricky for your team, imagine how your interview candidates feel. Instead, start with our questions template. Hiring a top candidate is a win for them and your team. Without an organized hiring process, recruiting teams move slowly or leave interviewers unprepared. Poor experiences can mean losing out on key candidates. Instead, recruiting teams can rely on a consistent interview process so everyone has the right information at the right time. After all, it’s not just the candidate who wants to look professional in the interview. Create a consistent experience. Start with a bank of questions in our template so you can ensure you’re asking a consistent set and no teammates overlap or miss topics. Keep the process organized. 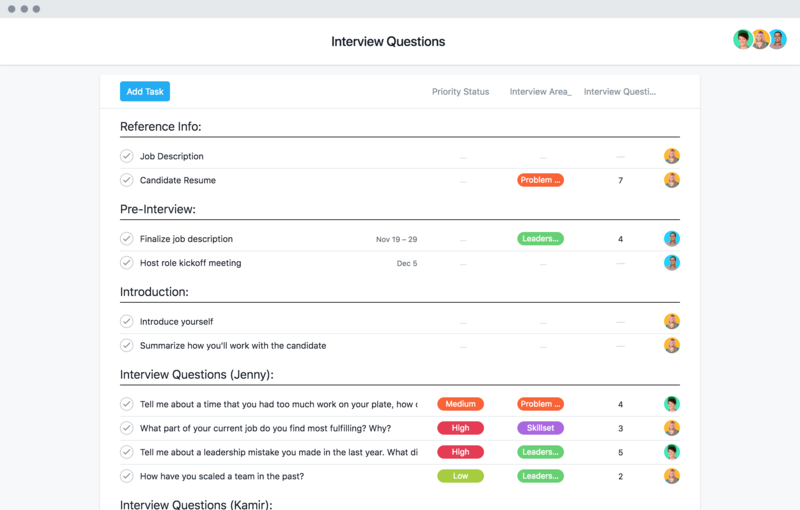 Responding quickly to candidates and keeping their interview process consistent can help you secure top candidates faster, instead letting details slip through email. Save your own templates. As you hire, you can save templates for roles you’ve hired for. That way, when you need to hire again, you don’t have to start from scratch. Take charge of the candidate experience—and make things easier on interviewers—with these tips. Learn how Olo crafts the complete onboarding experience for an excellent company culture overall. Asana Premium has everything you need to create the perfect employee experience from day one to long-time tenure. See how with a free trial.